Vitamin Ingredients Market for Food & Personal Care Applications is set to surpass USD 7 billion by 2024; according to a new research report by Global Market Insights, Inc.
Increasing demand for natural cosmetic products majorly among the millennial population may stimulate vitamin ingredients market for food & personal care applications. These skin care products have the potential to reduce wrinkles, dark spots, aging-induced cell damage and inflammation which may further boost industry growth. These products are micronutrients essential for optimal body health and defense from several illnesses including night blindness and rickets. Various nutraceutical capsules are based on two stage or dual release technology which comprise of multiple layers of fat-soluble and water soluble products which improve vitamin bioavailability in the body. Several products such as B and C are water soluble which are not produced in adequate quantities by the body thereby leading to serious deficiencies, thus requiring dietary intake and stimulating the vitamin market growth. India vitamin ingredients market for food & personal care applications is predicted to witness gains at about 5% in the forecast timeframe. Increasing awareness for child malnutrition along with shifting focus on healthy lifestyles may drive market growth. The country witnesses high demand for multivitamin supplements owing to less consumer knowledge of specific vitamins. However, major manufacturers are trying to rectify this lack of awareness by conducting large scale advertising campaigns which may boost vitamin ingredients market for food & personal care applications. High adoption of synthetic production techniques which require coal tar derivatives and petroleum based raw materials leads to pollution. Rising number of environmental regulations to curb pollution may hinder growth of vitamin ingredients market for food & personal care applications. Moreover, increasing efforts by regulatory bodies to prevent misleading claims on nutritional labels along with regulations to prevent toxicity may further stimulate vitamin ingredients market for food & personal care applications. Germany vitamin B3 market size from nutraceutical applications shall surpass USD 1.7 million by the end of projected timeframe. These products play an important role in cholesterol management along with providing safety and efficacy. Rising involvement of consumers towards physical health & fitness along with requirement of appropriate diets thereby enhancing healthy metabolism is expected to positively enhance vitamin ingredients market for food & personal care applications. China vitamin K market share from food applications may expect substantial gains at over 3% over the forecast period. Inefficient intake of these products is highly related to development of osteoporosis creating serious health issues and weak bones. 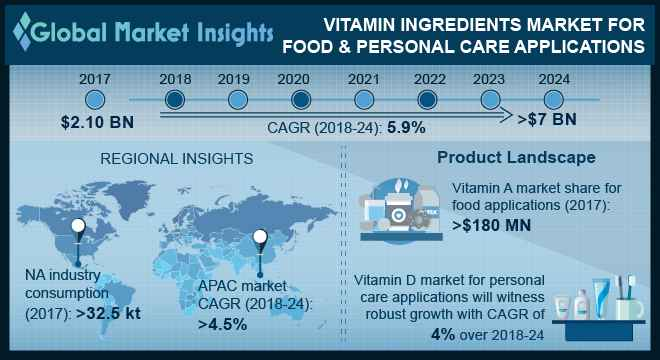 Presence of large population, improving logistics sector along with rising food safety concerns may foster the regional growth of vitamin ingredients market for food & personal care applications. Nutraceuticals applications from vitamin K market demand may exceed consumption at 2.1 kilo tons by 2024. These clotting factors which may cause excessive bleeding Moreover, this nutrient has a major role in breaking down body fats, blood sugar regulation, and maintaining bone & heart health. Vitamin K are used to treat deficiency of blood supplements are available in various forms such as chewables, softgels, tablets and capsules which allows convenient consumption and stimulate the growth of vitamin ingredients market for food & personal care applications. BASF, Pfizer, DSM, Nestle, Groupe Danone, and Lonza are some of the prominent manufacturers in vitamin ingredients market for food & personal care applications. Several manufacturers are focusing on strategic mergers & acquisitions to strengthen market position and achieve market expansion. Moreover, some companies have adopted innovative approaches thereby achieving product development, expansion of product portfolio and growth in vitamin ingredients market for food & personal care applications.